Discussion in 'other anti-trojan software' started by POS, Oct 26, 2005. Is there any truth in this test? That depends on how you look at it, i'm sure the results are correct, but it's not a very good "test" to make" any decision about buying an AT, A2 has been dealt a winning hand even before the "test" was made, because it can't be any surprise that they detected all samples, i mean they made this themself and they have off course choosen the samples carefully so they would look invincible. If this had been a independant test, it would most likely have been a different picture, they also leftout Ewido, maybe on purpose:https://www.wilderssecurity.com/showpost.php?p=512767&postcount=11, since this was a scanner test. A2 has been dealt a winning hand even before the "test" was made, because it can't be any surprise that they detected all samples, i mean they made this themself and they have off course choosen the samples carefully so they would look invincible. (1) I have noticed that KAV does well on ANY test where they are included -- even those *in-house tests* conducted by competing products. I feel this is extremely significant. (2) I would think that a reasonably effective AT would score at or above the median level on just about any test bed of malware nasties. If nothing else, therefore, A2's test makes me glad I didn't shell out $$ for The Cleaner. There is no need for an ondemand scanner when you have a real time scanner, is there? In this day and age, by the time a scanner picks up something, it is too late. But controler guy, you are correct - and pure plain jane on access scanners simply can't do it all anymore. I still use ondemand scanners and find them useful. Some things can still be detected that way and they make an excellent backup to realtime scanners. But I agree that realtime should be your first line of defense. its power lies elsewhere, and its protection methods can basically reveal any malware trying to install. Yes, the "funny" part of it is that The Cleaner was one the first AT's around together with BOClean & TDS-3, so they should have had plenty oppotunity to add to their bases, unlike A2 & Ewido who have had play catchup and have done so in a convincing manor, i wonder if The Cleaner is destined for what happened to TDS-3? I don't think there will be more than 2 max 3 effective AT solutions in a couple of years, because most of the AV's will also have proactive defenses shortly and nowadays all AV's take trojans, seriously even if there are major differences in how good they are. The costumerbase is basicly you and me (i have 2) and the rest of the security-forum users, oversimplified of course. Anyway this was a scanner test and the most important part of an AT is the real-time monitor and i do believe you have the full version? I do believe you have the full version? I agree with your prediction. It's high time the ATs fight back!!! 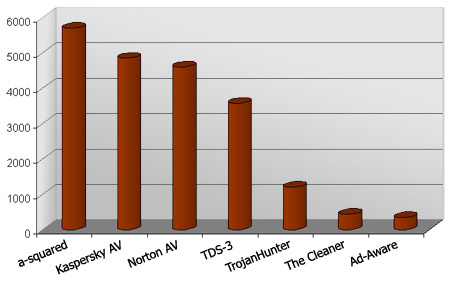 Since AVs are now covering trojans as well as viruses, why doesn't A-squared start covering viruses as well as trojans? After all, A-squared already covers MUCH more than merely trojans, so expanding to the *other nasties* should be a piece of cake, wot? Concerning which.... I think the expertise at A-squared is fully equal to that of the *better* AV programs. So.. Toadbee is the name of a pony?